Not all economy classes are created equal! From its earliest days, when THAI was just a small regional carrier, the dynamic growth and unrivalled reputation of this airline has been inspired especially by one outstanding feature — the superior quality of its Economy Class, offering levels of space, comfort and service unmatched by other airlines. The welcome is always genuine, with extra personal touches which come naturally to our dedicated cabin staff, for whom friendly hospitality is much more than a duty. Over the past two years, THAI has carried out a massive programme to expand and revitalize every aspect of its Economy Class experience, giving passengers even more reasons to make THAI their airline of first choice. New, wider seats of the latest design have been installed in many of THAI’s aircraft, with a new interactive Audio Visual On Demand (AVOD) system offering almost unlimited choice of entertainment and information options*. 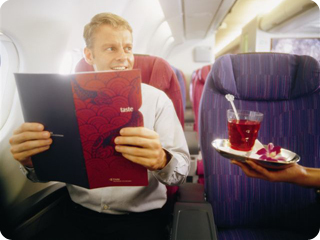 Economy Class meal plans have been enhanced, to add tempting variety, including a range of special menus, for religious, health or dietary preferences, which may be ordered in advance. (See Special meals service page on this website). 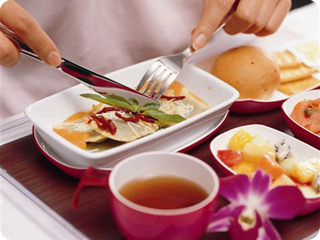 On international flights there is a choice of main course dishes, with a complementary full bar service and selection of wines. Pillows and blankets are always available, plus toys for children. Newspapers and international magazines are offered, including THAI’s own «Sawasdee» magazine, providing interesting reading and information on inflight entertainment, THAI routes and services. Perhaps the most memorable features of THAI’s flights are the little extra touches which are so typically Thai, such as the traditional wai gesture from our crew to welcome passengers on board, the presentation of fresh orchid corsages to lady passengers**, or the hot and cold refreshing towels offered during each flight. In addition, Economy Class passengers can earn valuable miles, on both international and domestic flights, with Royal Orchid Plus, THAI’s award-winning frequent flyer programme. * Available on B777-200ER, A340-600 and A340-500. **To destinations where local quarantine restrictions allow.